So, who really wants to go to the murder capital of the world? Because we have never visited South America, we decided to check out Colombia because it is very close to Panama, being just at the eastern border. The PanAmerican Highway, which links North America to South America, stops 160 Kms (about 99 miles) short of Colombia due to the very dense Darien jungle and swamp area. It is impossible for motorized vehicles to get through and it is highly unlikely that they will ever build the highway through this area due to the extremely high economic and environmental costs that would be incurred. 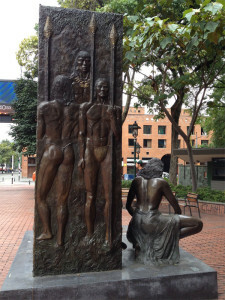 So, we decided to check out flights to Colombia and liked what we learned about Medellin. Now, this is not the Medellin of the 1980s when Pablo Escobar’s reign of terror changed a prosperous city to a place that was known for the highest murder rate in the world! No, we are talking about Medellin of 2015. Recent surveys say Medellin is one of the best cities to live in in South America, sharing first place with Santiago, Chile. 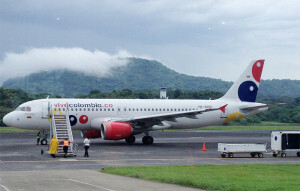 We booked passage on a Viva Colombia jet going out of Howard Air Base, which is only a 45-minute drive from our place, as opposed to at least 1 1/2 hours from Tocumen International Airport in Panama City! Howard Air Base is being converted into International Panama Pacific Airport, but for now is one rather small building with an airstrip in an area that was repatriated from the US after the handover of the Canal. So, our friend Bev dropped us off at the airport the day we left. There were not very many people around, since this was the only flight at the airport for the entire day! There were not even very many people waiting to board the plane–probably about the same number of people as were working at the airport. We stood in line to check in and met a young lady from Holland who had traveled from Belize to Panama and was going to Colombia before heading back to Holland and back to school. She didn’t make it onto our flight–we never found out why, but when you travel in Central or South America, you had better be sure you have all of your documents in order, or you might just get left behind! Security checks were without hassle and stress. We were able to sit in a freezing cold area as we watched our flight arrive, unload baggage then reload our baggage–it was like watching a movie from the 70s–no motorized carts, no conveyor for loading and unloading, no jetways. But we liked it because we could watch our suitcase being put into the plane! I personally welcomed the walk to the plane because it was a chance to get a little bit warmed up.Alas, it was as cold on the plane as it had been in the waiting area! Our flight took only one hour and went smoothly. Needless to say, we weren’t offered any refreshments on the flight! 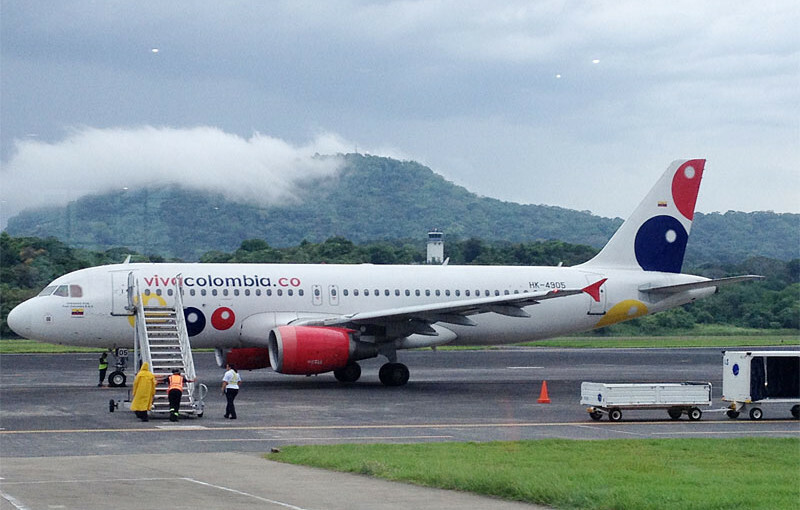 We arrived at the Medellin airport, which is at an altitude of over 6,000 feet! The air outside was clear and cool as we took a cab ride into the city of Medellin. The ride into Medellin took us up and down, through some beautifully scenic landscape. Medellin is located on hillsides and into a river valley and has an elevation close to that of Denver. Our cab driver thought the day was very warm and kept all the windows open–he had no idea that a hot day in Panama is just right for me! Our hotel was in a residential area just one block off Avenida El Poblado, the main drag through the area, which boasts world-class shopping, restaurants, cafes and nightlife. We checked in and headed out to explore the area in the cool evening. Our exploration went in one direction: DOWN. This city is built on hillsides that make you wish you were training for an Iron Man competition! We made our way down to the main street and stopped into a sidewalk cafe for a glass of wine. Our climb back up to the hotel was strenuous and interesting! We have gotten to be wimps since leaving Frisco, Colorado and the 9,100 foot elevation there. In Medellin, we really felt the 4,500 feet above sea level! The next day, we decided to get an impression of the entire city by taking the on-off bus tour, which takes you all over the city to points of interest where you can choose to get off & spend some time and wait for the next bus to continue on the tour. 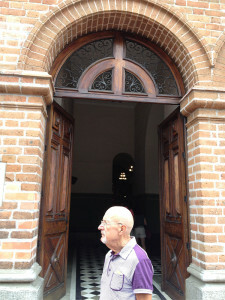 We like this way of getting familiar with a city and we liked what we saw in Medellin. The city is cradled on all sides by lush, green tropical mountains. It is an international trade and business center and a hub of international fashion and music festivals. It is popular for medical tourism and known particularly for plastic surgery and cosmetic procedures. It boasts many parks, community centers and libraries open to everyone. 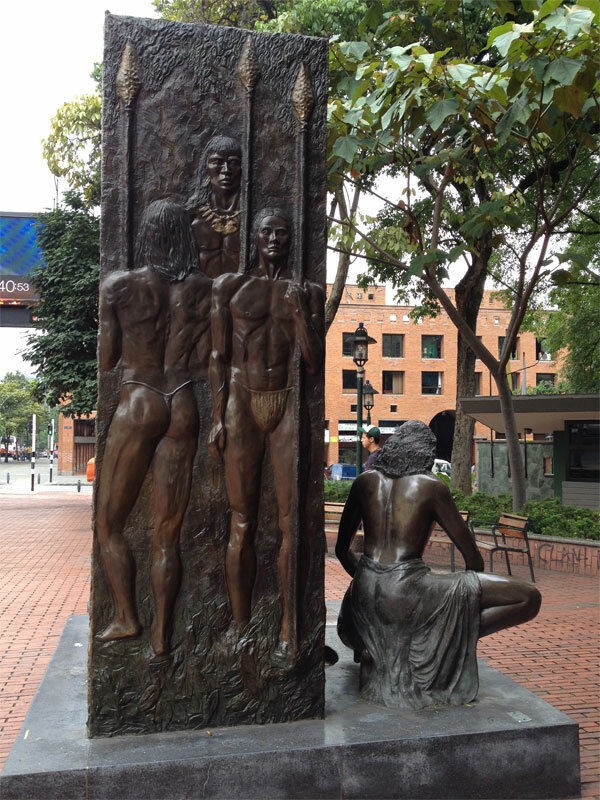 Medellin dates back to 1616. 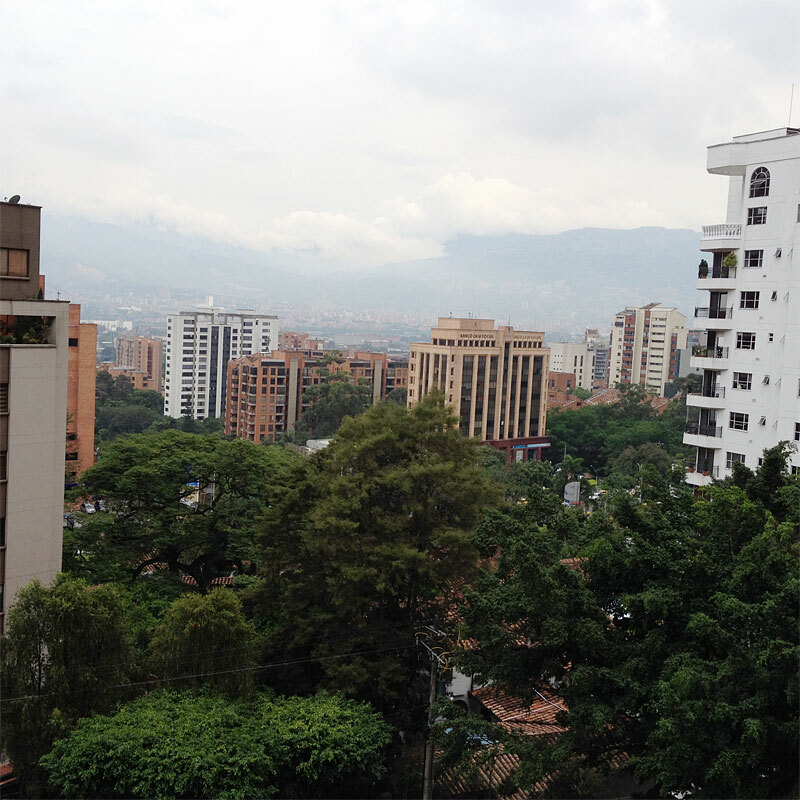 The development started in El Poblado, the area where we stayed and which is the premier area of Medellin. This is where you will meet many foreign nationals who have retired here and foreign investors taking advantage of the extremely low prices for real estate due to the strong US Dollar. The cost for real estate, thanks to the exchange rate, is down about 25% and the quality of real estate in Medellin is first class! The cleanliness of the city and elegance of the many shops reminds me of Barcelona. There are many opportunities to buy real estate investments with up to 8% guaranteed dividends and a return on investment around 16%! Investments start at just $30,000. Life in Medellin, a city of 3.5 million people, is extremely comfortable. It is called the city of eternal spring because of its temperate climate. 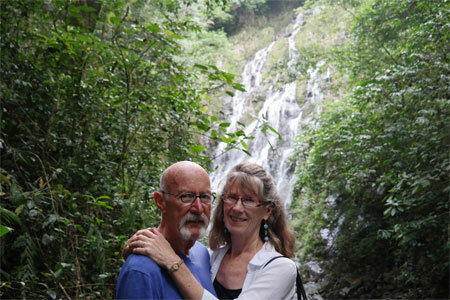 The low cost of living lets you enjoy retirement with luxuries you can only dream about in the U.S. The restaurants offer a huge variety of local and international dishes at very reasonable prices. 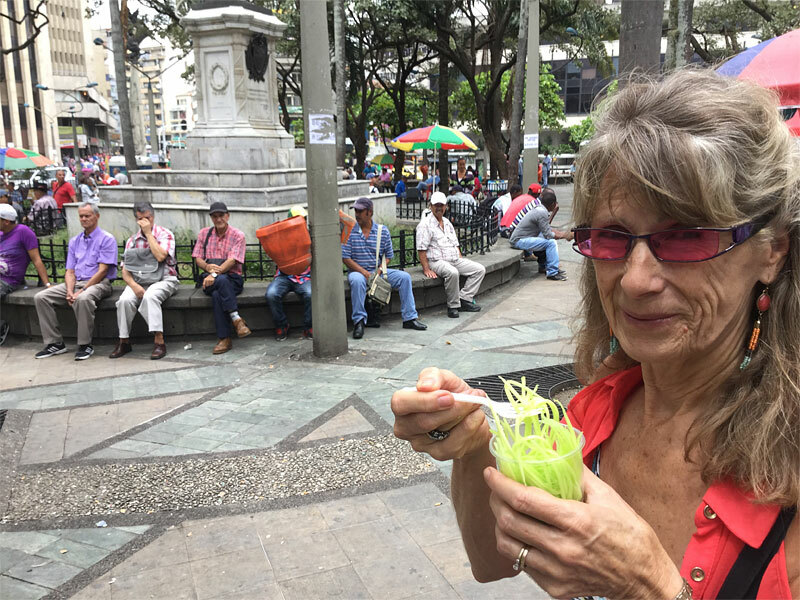 Health food is popular–and not just because of the tourists. It is a part of Medellin’s lifestyle. Talking about lifestyle, we happened to go onto Avenida El Poblado on a Sunday morning and were surprised to see one full side of this major road closed to traffic so that pedestrians, bicyclists, runners, joggers, families with babies & dogs could get out for some exercise without having to fight traffic. In some areas along the way groups of people were doing dance-type exercising–just a huge community get-together with basically everyone included. No police cruisers! Just a wonderful relaxed and friendly atmosphere. As you can see, we had a great time and really enjoyed this city. If Medellin had an ocean, we might be tempted to spend longer periods of time there!